This review is going to contradict itself several times. 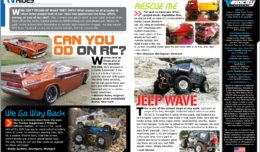 I’ve been reviewing RC cars for nearly 20 years, and this is the first review I’ve written where I had trouble figuring out how to present my findings to the public. 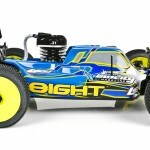 This Losi 8IGHT Gas Buggy by Horizon Hobby is based on the awesome TLR 8IGHT 3.0, and just to be even more confusing, it isn’t a TLR but is sold under the Losi label. In this case, that confusion is probably deliberate, and welcome. 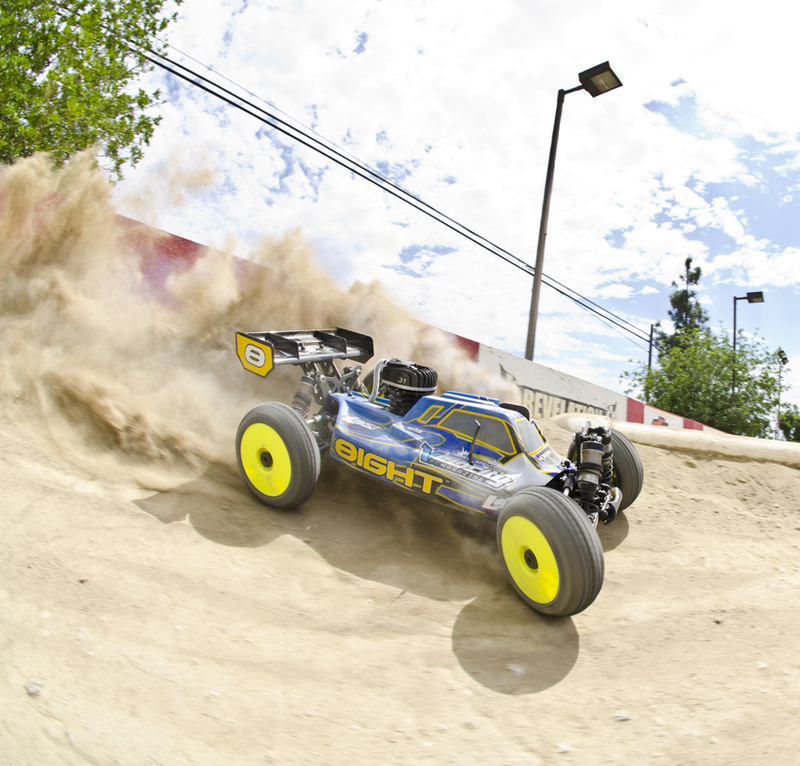 This is arguably the world’s best RTR nitro buggy … or it would be, if it had a nitro engine. The difficulty in writing this review is that the engine—in this case, a Dynamite .31 gas engine—is what creates the drama in the narrative. We here at VRC were hoping that this new engine would provide a spark (pun intended) to the nitro racing scene, but it actually did the opposite. Here’s how it all went down. Damping (F/R):	40 wt. / 20 wt. Dynamite or Dynomite_ The ‘70s sitcom reference aside, the main “selling point” of this RC was its powerplant. It’s like hydrogen-powered cars at this point in time; They seem like the future, but we’re just not in the future yet. This engine runs on pump gas that is blended with 2-stroke oil. No glow plug is needed, but the ignition system runs off the RX pack, and that in itself limits what is possible with the engine. More on that later. Hidden 3.0_ It’s a bit strange that the 3.0 extension isn’t in the name of the kit, but the good news is that all the delicious upgraded suspension and shock bits of the Race Chassis are found on this RTR. 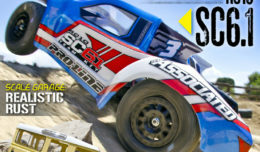 What’s in the box_ What we absolutely love about Losi gas/nitro RTRs is that you get just about everything you need in the box. A Spektrum radio with AVC, LiPo receiver pack, and even a starter box are all included. All that’s missing are the batteries for the box, but we’ll forgive that oversight. Fluid check – All three diffs are pre-filled with diff oil for better handling. 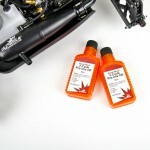 150cc tank –A screw-top lid covers up a full 150cc gas tank…and in this tank a real gas. 15+1mm–That’s beefy 16mm shock bodies, for all the math impaired. They feature the new plastic shock caps with handy-dandy bleed screws. They work, and work awesome. 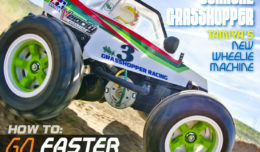 A new chassis– A stamped version of the race chassis delivers a rigor-mortis-stiff 4mm chassis. Turn Radius:	3 ft., 9 in. Acceleration & Speed_ When we actually got the engine to run correctly, it provided great acceleration and power. The problem was that after break-in and hours of tuning and testing, we couldn’t keep the engine alive and running for any length of time at all. What little we saw of the chassis’ potential when powered up, we liked, but its speed was limited by the engine’s lower RPM. It’s handicapped about 8,000rpm, which means it needs a taller gear to keep up with a nitro .21/.28. Braking_ On a dime. Simple. The brakes work well and are very linear. They have the advantage of being tuned by the race team for years, and the performance is top of the class. Bias is easily adjusted. The major downer is the radio’s lack of EPA. This means full brake tries to break the radio tray. There is some secret Contra code to access EPA in the radio;we just suggest upgrading the radio ASAP. Low-Speed Handling_ We will mention 101 times our troubles with the engine, and we will try to separate our feelings of anger toward the engine and spare the actual car. The stock setup/tires worked very well on the track. Turn-in was immediate, and once the weight transferred, the car was pretty locked in at low speeds. Despite engine trouble … the chassis is begging for an engine to exploit it. High-Speed Handling_ During our tease with the engine actually running, the handling on the faster sections of the track was great. The AVC made it even easier. (Don’t know what that is? Look up our feature on the Spektrum AVC from Issue #16.) Even with our anchor engine, the speed at the end of the straight was just a few clicks off a nitro version. Jumping_ The chassis is dialed. Once they offer the standard nitro engine, this kit will again be the best 1/8-scale on the market. The 8IGHT squares up nicely, and the suspension is ready for the launch and landing. Even if you get it wrong, it’s a stellar jumper. Wear & Tear_ Normally, this is where we look for weak spots on the chassis, but this is the spot where we’re going to call out the engine. We spent more time trying to get it to run right. We overcame the car shutting off when the brakes where applied. We got it to run sitting on the starter box to a point where it tricked us into thinking it was tuned right. As if it was mocking us, though, as soon as we got on the track, the tune would change, and we couldn’t keep it running for more than a few minutes before it shut off. We replaced a bad switch that would shut off the engine over a jump, and we swapped out the flywheel to try and eliminate the magnet on the flywheel not sending the signal to fire the spark plug. Despite our best attempts and factory help, a frustrating 3 days of testing barely resulted in much runtime. Even if we could get it to run, the receiver pack itself powers the ignition system, and that battery can only power the car and the spark for 30 minutes max. After that, you need to charge the battery. What? How can the box pump up the extended runtime over nitro and have this fatal flaw? It’s inexcusable, and we can’t understand how it was ever released to consumers. Tuning_ The chassis has all the tuning options the race kit has. The box setup is solid, and it’s easy to borrow any pro setup to go faster around the track, or even just to bash. We’d like to say we got a lemon, but a quick search online shows lots of problems with the engine. It’s sad because we actually support companies sticking their necks out with new technology and we normally cut some slack, but this is simply inexcusable. The nitro engine that was previously included was great, and it was the best combo on the market. Now, it’s not. And that is the result of trying to do something different. 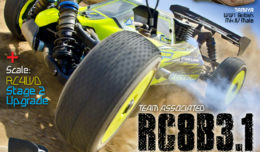 We’re not sure what Losi is going to do, but our guess is that you’ll see a nitro RTR version back on the market soon. We haven’t given up on the engine, and we’re trying to figure out the magic combination to get it to run consistently … at least until the new kit comes out. 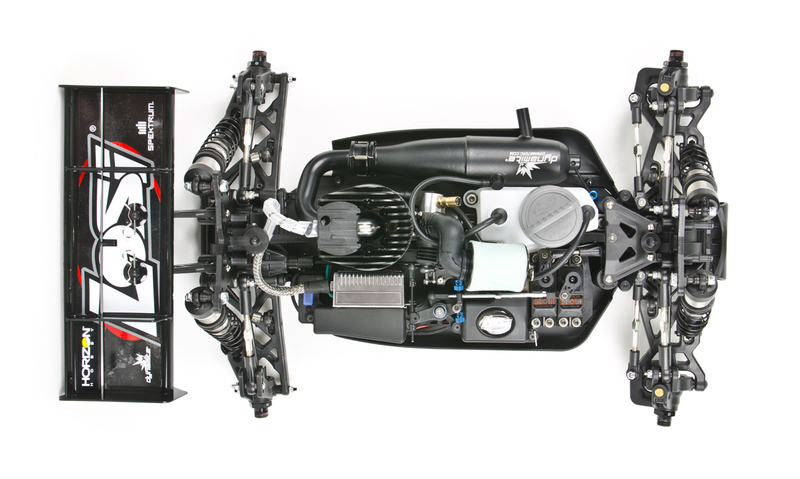 Great chassis, but without power going to the wheels, we can’t say this kit is a must-have. On paper, we love this thing. Electronic ignition. No glow plug. A cool silver “magic” box that makes it all happen. Even our dyno was given fool’s gold, as our review of the engine is capable of putting out a nice power curve. This is where if you have a dyno, you can’t avoid real field testing. The dyno requires the engine to perform for 20 seconds max, and the track is up to an hour. There was so much frustration getting this to run, it’s hard not to want to punch the engine in the face. We’d draw a face on it to do it. Man, we wished this wasn’t the outcome of this test. When it did run, the power delivery was good; it doesn’t sing like a nitro mill, but it put power out. • Comes with starter box. 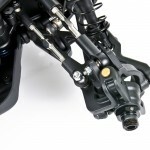 • Spektrum AVC and decent RTR servos. • Pump gas means it’s $3/gallon! • Once it’s sold with a nitro engine … the best on the market. • Engine could never be tuned to run for more than a few minutes. • 30 minutes of runtime, and then you need to charge the RX pack for 20. • Gas is cheap, but you smell like a landscaper after running. Like this review? 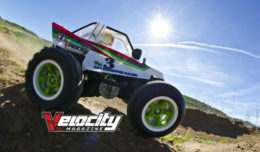 Velocity RC Cars Magazine is an independently own magazine that produces world-class articles. Supporting us is easy. 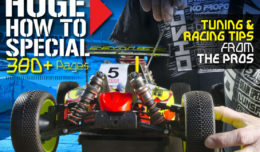 Subscribe, or purchase a single issue of VRC Magazine today. Download right to your Tablet or computer.